Bibinka is a baked rice cake from the Philippines. It’s generally consumed for breakfast during the festive period and topped with grated coconut, sugar or cheese. The main ingredient in traditional bakes is fermented glutinous rice which gives a slight sour taste. The rice is mixed with coconut milk prior to baking. The rice cakes are then cooked in banana leaves over coals which gives them an additional smoky banana flavour. These days, it’s more common to use rice flour and tins. My gluten-free coconut cakes aren’t cooked in banana leaves nor do they contain any rice. And to think I’m one of those people who shouts at the telly when a favourite novel is massacred in the name of adaptation. 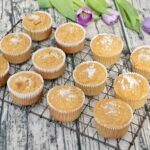 I used Free From Fairy’s gluten-free flour, which is my favourite gluten-free flour for baking. It performs well, but also fits right into my whole food ethos as it’s a mixture of wholegrain teff, sorghum and buckwheat with potato and tapioca starches thrown in for good measure. For the coconut element, I used coconut flour. I substituted kefir for the coconut milk which gives the requisite fermented sour notes. If you don’t have copious amounts of homemade kefir about the place, as I do, you can use buttermilk or watered down yoghurt instead. The method is an easy one. Mostly, you just need to add the wet ingredients to the dry ones and stir. There are a couple of additional steps you need to take though. You’ll need to melt the butter and also whisk the sugar with the eggs vigorously to remove any lumps in the sugar. In my experience brown sugar always has lumps in it. The cakes are the right side of dense and not at all stodgy. They are quite filling though. That didn’t stop CT from wolfing two down as soon as he got home from work. The brown sugar gives them a slight caramel tone, but they’re not overly sweet. In fact I had a couple for my breakfast this morning and enjoyed them; I’m not usually one for sweet stuff first thing. 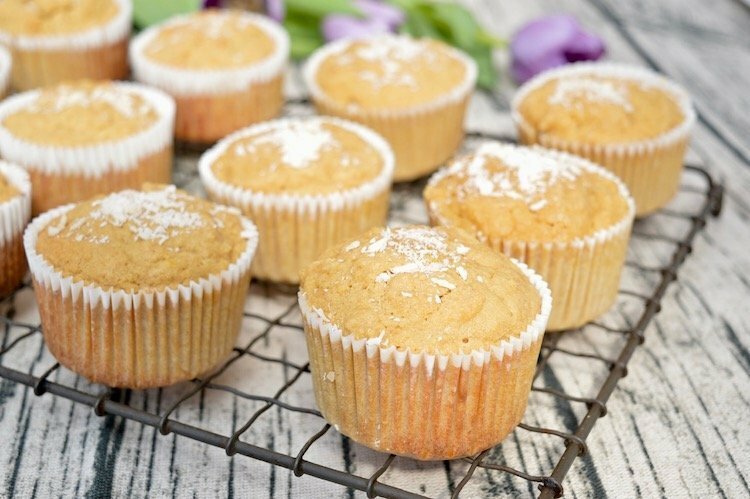 Do have a go at making these gluten-free coconut cakes, they are so very easy. Bake a batch and you’ll have a ready-to-eat breakfast that will last over several days. Plus, did I mention, they’re very satisfying. Gluten-Free Coconut Cakes. PIN IT. Thanks for visiting Tin and Thyme. If you make this recipe for gluten-free coconut cakes, I’d love to hear about it in the comments below or via social media. Do share photos on your preferred social media site and use the hashtag #tinandthyme, so I can spot them. For more delicious and nutritious recipes, follow me on Twitter, Facebook, Instagram or Pinterest. Filling little coconut cakes with slight caramel tones and sour notes which actually make them really good for breakfast. Super simple to make. Sieve the flours, baking powder and salt into a large bowl. Make a well in the centre. Whisk the eggs and sugar together, in another bowl, until there are no lumps of sugar left. Pour into the flour well along with the butter and stir from the inside out. Gradually add the kefir as you go until everything is well mixed. Line 12 holes of a muffin tin with paper cases and divide the mixture between them. Bake in the centre of the oven for 25-30 minutes or until the cakes are risen and golden on top. Sprinkle with a little desiccated coconut and leave on a rack to cool. Will last for 4-5 days if kept in an air tight container. Please note: calories and other nutritional information are per serving. They're approximate and will depend on portion size and exact ingredients used. 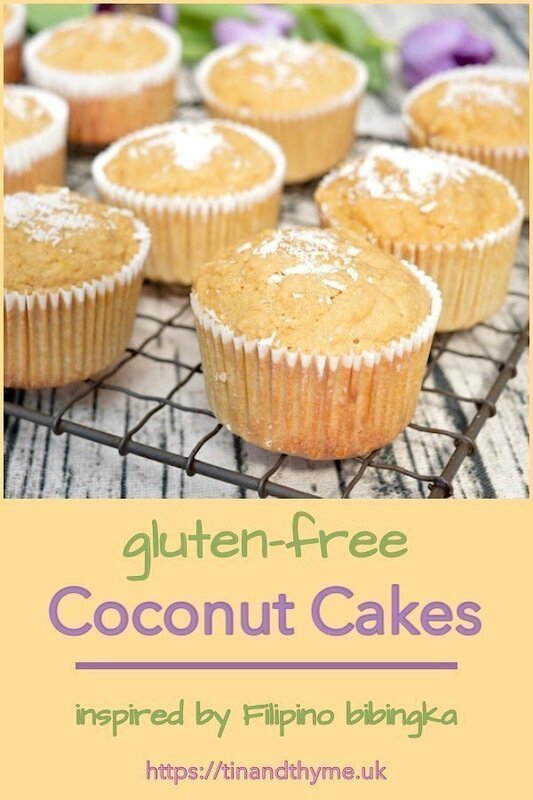 I’m sharing these simple gluten-free coconut cakes with Apply to Face Blog for #BakingCrumbs. They also go to JibbeJabberUK for Love Cake, Mummy Mishaps for #BakeOfTheWeek and Everyday Healthy Recipes for #CookBlogShare. These do make a perfectly healthy and yummy treat for the breakfast, or afternoon snack. Have only had Bibibingka once and never thought to make at home. These look really great, and a really nice idea for an unusual breakfast. Oh, I’m super impressed you’ve had one Kavey. What was it like? So interesting to learn about this recipe. I am a coconut lover so these would be a delightful breakfast treat. Coconut is such a fine ingredient. I really like it too. Coco-nuts indeed. Free from Fairy’s flour is definitely my favourite gluten-free flour – not that I’m an expert. I’m a big coconut fan so I’m sure I would love these cakes – they look delicious! Thanks Nikki. They aren’t the sweetest or lightest of cakes, but we’ve been enjoying them and they last well too. I love anything coconut. This sounds very interesting and super delicious. Need to try these. 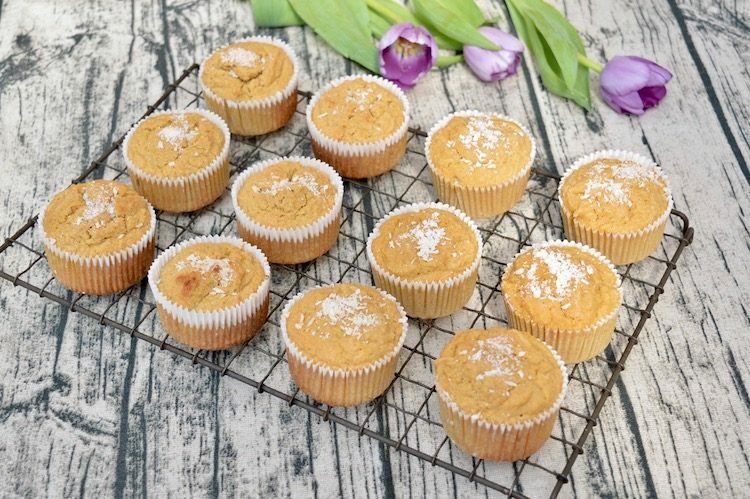 They’re a great gluten-free bake but also a nice change to more traditional cakes. 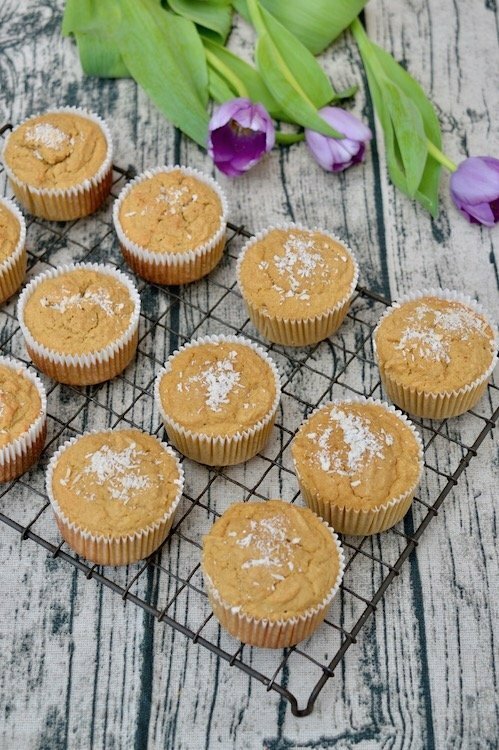 These look utterly delicious, and so light and fluffy for being gluten free! I’ve never heard of this recipe before, but I’m keen to try it. Thanks Elizabeth. I think light and fluffy is a bit of an overstatement, but they do have a nice texture. Gluten free is a win and we love coconut around here. Would be so good with some tea or latte. Definitely good with both tea and latte Angela, especially a matcha latte. I’ve been having them for breakfast most days this week and I wouldn’t be doing that if they were overly sweet. Anything with coconut in is always fine with me! These sound delicious! Yes coconut is a fantabulous ingredient and very popular in this household too. Thanks Jac. They are very good, though not what you’d expect from an ordinary cake. These look so good! I’ve never used kefir in a recipe. What is the benefit? Kefir works wonderfully well in baking. It reacts with the raising agents and helps with the rise. But it also has lots of health benefits. You can find out a bit more about it in this post. Thanks for sharing! What a great breakfast meal prep idea for the whole family! It’s certainly a really useful breafast for eating on the go. Hahaha Jenny. They’re actually quite substantial, so I very much doubt you’d be able to sink five, even if you really wanted to. I love the idea that you used kefir in the recipe. I never remember to do this! Kefir is ingrained in my psyche Heidi. I’ve been using it for over 20 years.